Severe hot and dry “devil winds” kicked up on Sunday, November 11th in fire ravaged Southern California and more winds were expected in the north, fanning the flames of wild fires that have killed at least 25 people, officials said. “We’ll get sustained winds of up to 40 mph (64 km/h) and gusts between 95 – 112 km/h” he said early Sunday of the Santa Ana “devil wind” hitting the Los Angeles area where the Woolsey Fire has been burning since November 9th in the tinder-dry canyon of Ventura County and claimed at least two lives. The air-masses blowing across the western US deserts including Death Valley toward the coast are expected to bring the sustained high winds at least through Tuesday, he said. Additional 64 km/h winds will blow across the Sierra Nevada foothills in Northern California near Sacramento where the so-called Camp Fire has claimed at least 23 lives. 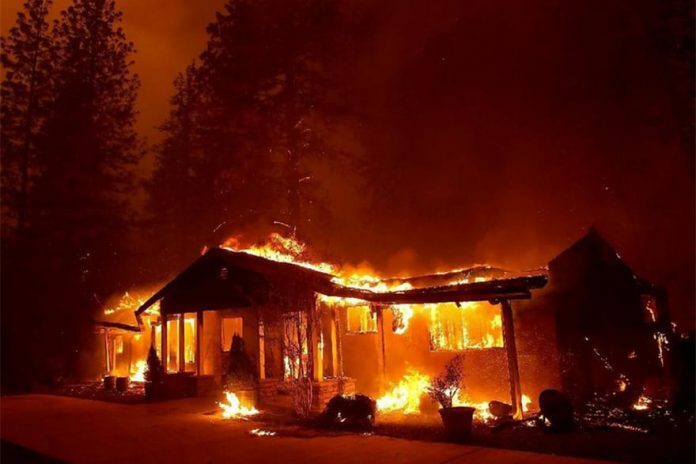 As of Saturday night, the Camp Fire had blackened more than 40,500 hectares at the edge of the Plumas National Forest. Crews had cut containment lines around about 20 per cent of the blaze. About 800 km to the south, the Woolsey Fire burning in the foothills above Malibu doubled in size from Friday night into Sunday threatening thousands of homes after triggering mandatory evacuation orders for a quarter million people in the upscale beach city as well as other communities in Los Angeles and Ventura counties. The fire has destroyed at least 177 homes and other structures with a full count still under way, and has charred more than 33,500 hectares. Mr Trump, a Republican, has previously blamed California officials for fires and threatened to withhold funding, saying the state should do more to remove rotten trees and other debris that fuel blazes.